1. Take precautions and be mindful of your environment. Keep food and drinks covered when outdoors, particularly sweet things that attract bees and wasps. 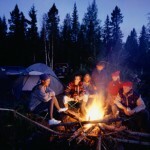 Avoid camping near water such as ponds or swamps, because this environment attracts mosquitoes and horseflies. 2. Watch what you wear. Mosquitoes in particular are attracted to clothing with dark colors and floral prints. When in wooded areas, wear light colored clothing and long pants, long sleeve shirts and closed-toe shoes to prevent tick bites. Light colored clothing also makes ticks easier to spot. Also avoid wearing products with strong perfumes such as soaps, shampoos and deodorants because they also attract insects. Always wear shoes when walking outdoors. 3. Be aware of time of day. The peak activity time for mosquitoes is between dawn and dusk. 4. Bug repellent. Spraying yourself with insect repellent before enjoying the outdoors not only guards you from itchy mosquito bites, but it prevents you from getting sick as well. Be sure to read the labels to ensure that you are using a repellent containing 20 to 30 percent DEET, and apply (and reapply) correctly. 5. Be prepared if you or a loved one has an allergy. Fortunately, most people only suffer mild symptoms from bug bites such as itching, stinging sensations or mild swelling. For severe reactions that include severe swelling, difficulty breathing, swelling of the lips or throat, dizziness, confusion, nausea or vomiting, call 911 or seek emergency assistance. Individuals with known allergies should always carry their prescribed medication. 6. Caring for the bite or sting. Both bites and stings respond well to ice packs. If you are allergic to insect bites, take an antihistamine as soon as possible, as it will reduce swelling and other symptoms. If the area is extremely itchy, apply a small amount of anti-itch or hydrocortisone cream. Proper safety measures will allow you and your family to enjoy the summer while protecting yourselves from bug bites and stings. AmeriStaff private duty and homecare nurses work with our patients to ensure that these precautions are taken prior to enjoying the outdoors.